ANNISTON, Ala. – Blastcrete Equipment Company’s new Mason Mate is an innovative machine designed primarily for high-rise block fill applications, as well as concrete repair and underground shotcrete for mining and tunneling applications. 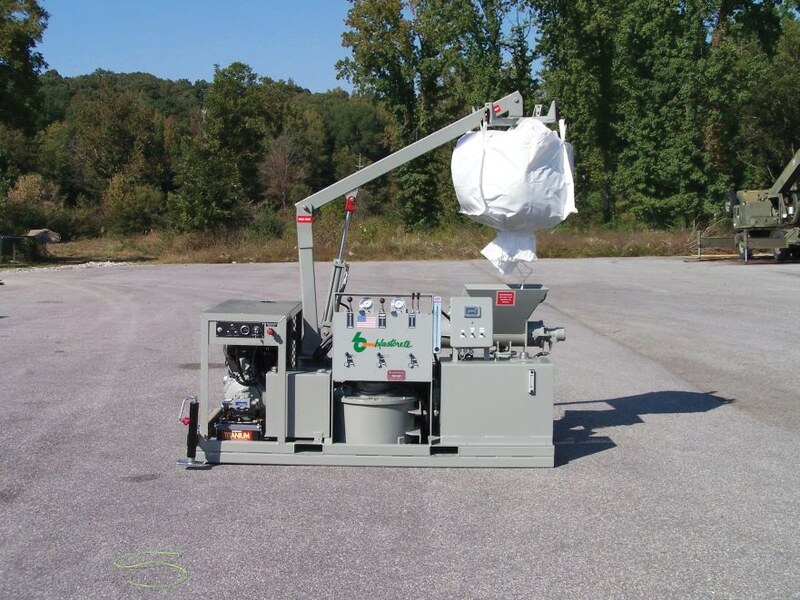 The unit features Blastcrete’s D3522 hydraulic squeeze pump, a high-shear continuous mixer and an optional 1,000-pound capacity bag lifter. Designed to increase material delivery time, the Mason Mate provides a significant time and labor saving solution on the jobsite. Unlike traditional, tedious masonry methods, the Mason Mate is designed to be a fast, efficient, one-man solution. Rather than mixing material and water offsite, then transporting the blended material with expensive telehandlers to be installed, the Mason Mate is able to perform the entire process from start to finish right on the jobsite, and requires just one operator. The unit saves valuable time by being operated onsite and in close proximity to the mason, while also eliminating the need for several pieces of large, expensive equipment, wheelbarrows and ?bucket brigades? consisting of multiple laborers. Featuring a compact design, the Mason Mate can be used in virtually any setting. It easily fits in the back of a pickup truck or in a freight elevator, and can operate within an 8-foot ceiling. Furthermore, the compact design allows easy maneuverability with a pallet jack and placement with a telescoping forklift or crane. The Mason Mate includes Blastcrete’s D3522, 2-inch hydraulic squeeze pump with variable speed up to 6 cubic yards per hour and a high-shear continuous mixer for increased speed and shorter mixing time. The unit is capable of pumping 3/8-inch aggregate mixes at 450 PSI pumping pressure. To relieve pressure build-up clogs and eliminate potential damage to the pump, the Mason Mate’s D3522 can be run in both forward and reverse. Hydraulic controls for the pump, mixer, and remixer are conveniently located on the operator’s control dash. The Mason Mate is designed for easy, simplified maintenance and cleaning. The primary wear part, the rubber pumping tube, can be easily replaced on the jobsite in about 20 minutes. And unlike other types of concrete pumps, clean-up on the squeeze pump is fast and hassle-free. Using just water and a sponge ball, the pump can be cleaned out in approximately 5 minutes. A 29 HP Kubota water-cooled diesel is standard. The Mason Mate is also available with either a 35 HP Briggs & Stratton gasoline engine or 30-horsepower electric motor with starter and disconnect. For 60 years, Blastcrete Equipment Company has been manufacturing safe, reliable and user-friendly solutions for the shotcrete industry. With a complete product line consisting of concrete mixers, pumps and related products, Blastcrete Equipment Company is poised to meet the needs of the commercial and residential construction, ICF and SCIP building systems, refractory and underground markets. For more information, contact Blastcrete Equipment Company, 2000 Cobb Ave, Anniston, AL 36202, call 800-235-4867, fax 256-236-9824, e-mail info@blastcrete.com, or visit the Web site at www.blastcrete.com.